Saint Peter Catholic School Uniform Policy is designed to make it easy for parents to purchase quality uniforms at reasonable prices. Our goal is to make it simple for parents and students to follow uniform guidelines. We have two types of uniforms: daily and dress. This page begins with information about daily uniforms; scroll down for the dress uniform information. ***Some items in the Dress Uniform must be purchased from Flynn O'Hara. Scroll down for Dress Uniform Requirements. Monogramming is available at the following local locations: Parrott Canvas (shirts are available there), Monograms+, Boston Bags & Tags, and Pirate Threads. Standard Athletic shoe/tennis shoe, closed at the toe and heel, tied laces or Velcro closure only. No loafer, Mary Jane or clog style shoes/sneakers may be worn. No added functions like lights or roller wheels are permitted. Solid Black, White, Navy, or Grey athletic socks; visible in the shoe, not pulled up to the knee. Traditional White or Navy knee socks for girls only. Solid white or navy tights. Footless tights are not permitted. 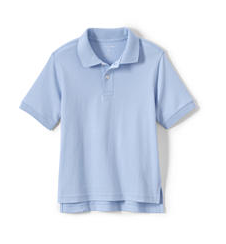 PK3: Light blue polo shirts—short or long sleeve with school uniform logo (see color below). Pull-up navy blue shorts, trousers, or skorts. 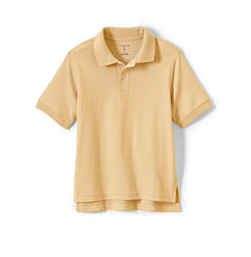 PK4: Light yellow polo shirts—short or long sleeve with school uniform logo (see color below). Pull-up navy blue shorts, trousers, or skorts. Kindergarten - 5th Grade: White or hunter green polo shirts—short or long sleeve with school uniform logo (see color below). No performance/"wick-away” fabric. Hunter green or navy blue sweatshirts with school uniform logo. Navy blue shorts, trousers, or skorts. Shorts and skorts no shorter than fingertip length with shoulders dropped. No “jeans style” pants/shorts. The items required to be purchased from Flynn O’Hara are: the white button-down dress shirt (blue & white stripe for 8th Grade), the Saint Peter striped necktie, grey dress pants, and the OPTIONAL sweater. Coats and jackets are allowed to be worn outside – including to and from Mass. The other dress uniform items (tan boat shoes or dirty buck oxfords, black or brown dress belt, and black crew socks) can be purchased through Flynn O’Hara, Lands' End, JCPenney, Belk, Target, Walmart, etc. The items required to be purchased from Flynn O’Hara are: the plaid kilt, the white buttondown blouse (yellow for 8th Grade), and the OPTIONAL sweater. Coats and jackets are allowed to be worn outside – including to and from Mass. The other dress uniform items (shoes – black & white saddle oxfords, dirty buck oxfords, or black Mary Jane’s; navy knee socks; or navy tights) can be purchased through Flynn O’Hara, Lands' End, JCPenney, Belk, Target, Walmart, etc. The items required to be purchased from Flynn O’Hara are: the blue button-down dress shirt, the green necktie, khaki pants, and the OPTIONAL sweater. Coats and jackets are allowed to be worn outside – including to and from Mass. The other dress uniform items (black or brown dress belt for 1st - 5th Grade only and black crew socks) can be purchased through Lands' End, JCPenney, Belk, Target, Walmart, etc. The usual daily wear shoes are acceptable - no other shoe requirement. The items required to be purchased from Flynn O’Hara are: the plaid jumper, the white with navy piping Peter Pan-collar blouse, and the OPTIONAL sweater. Coats and jackets are allowed to be worn outside – including to and from Mass. The other dress uniform items (navy knee socks and navy tights) can be purchased through Lands' End, JCPenney, Belk, Target, Walmart, etc. The usual daily wear shoes are acceptable - no other shoe requirement.